I like to think that a majority of the recipes I post on this blog are relatively easy for you to make. We don’t all have the time to spend hours in the kitchen preparing a fancy dessert. I think you can still make fancy desserts while enjoying the rest of your day. Last week I received another shipment of Walkers shortbread cookies. This time, my shipment contained chocolate shortbreads! I knew I wanted to create something different for this post. Since 2012, Walkers has partnered with The American Society for the Prevention of Cruelty to Animals® (ASPCA). This year, Walkers will donate a minimum of $50,000 to the ASPCA through the sales of their Scottie Dog shortbread cookies. For more information about Walkers partnership with the ASPCA, visit their website. In today’s recipe, I used their new Chocolate Scottie Dog Shortbread cookies, which use genuine Belgian chocolate, butter, flour, sugar and a pinch of salt. 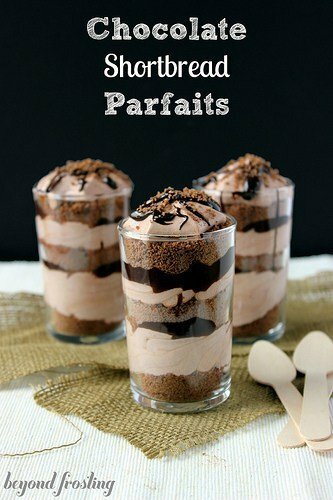 The recipe below will make four parfaits. To serve a larger crowd, use two boxes of Chocolate Scottie Dog Shortbread cookies and double the ganache recipe. Because it is difficult to half the ingredients for the mousse, you will end up with a lot of extra mousse. May I suggest diving into the leftovers head first? Start preparing the pudding by mixing the instant chocolate pudding mix with the milk. Place in the refrigerator and allow to set for at least 15 minutes until firm. Fold in one container of thawed whipped cream with a spatula and mix until incorporated. If you have time, put it back in the fridge for 15 minutes, but if you don’t that’s fine too. Use a food processor to grind up the chocolate shortbreads into fine crumbs. In a microwave safe bowl, combine dark chocolate chips with the heavy whipped cream. Microwave for 30 seconds. Remove and stir vigorously with a spoon until well mixed. Prepare instant espresso according to package directions. My instant espresso calls for 3 ounces of water to 1 teaspoon espresso and mix until dissolved. Measure out 2 teaspoons into the chocolate ganache and mix with a spoon until well mixed. Adding the instant espresso with help to thin out the chocolate and make it nice for dripping. I personally think it also enhances the flavor. 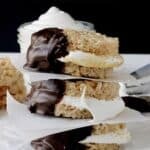 If you don’t have instant espresso, you can omit that step, but you may want to add additional whipping cream to help thin out the chocolate. 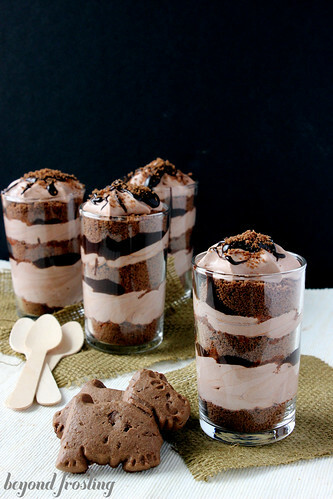 Prepare the mousse cups by adding one tablespoon of chocolate shortbread to the bottom of the glass. Use a spoon or piping bag and fill the cup half full with chocolate mouse. Next, take a spoon full of chocolate ganache and drizzle it on top of the mousse. Repeat this step two more times. 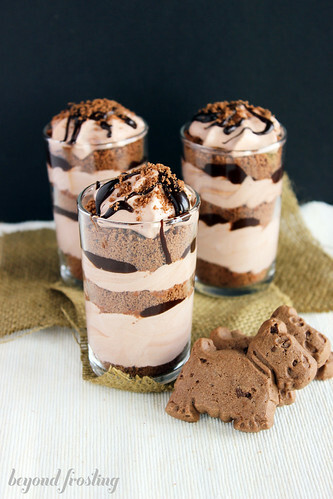 Each glass has 3 tablespoons of shortbread cookies, three layers of mousse and 2 and half spoon fulls of ganache. Serve these cold and keep refrigerated. 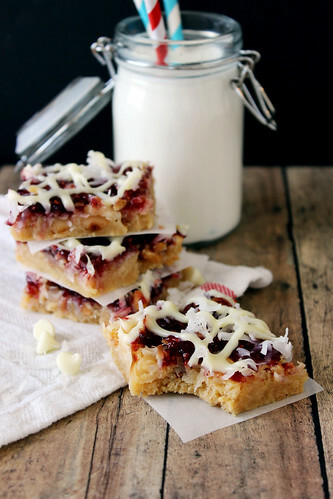 No bake desserts are great for hot summer days when you don’t want to turn on the oven! In order to help make your summer more chocolaty, Walkers is offering my readers free shipping on orders over $25. Additionally, if you purchase any Scottie Dog cookies, Walkers will donate an additional dollar to the ASPCA on behalf of Beyond Frosting. The promo code for free shipping is: BFSCOTTIES and is valid until June 28th. Head over to the Walkers website to start shopping! 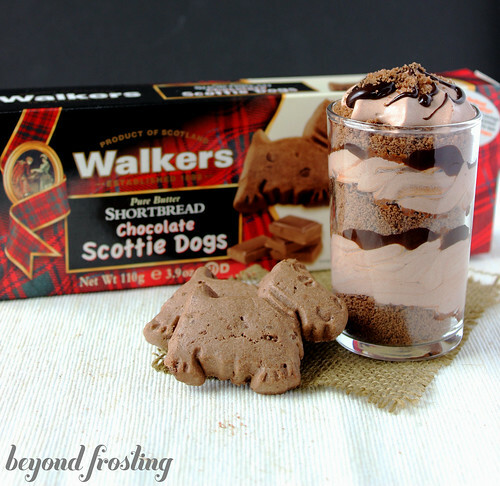 Walkers Shortbread provided me with free samples of these cookies to review. All opinions expressed in this post are my own. I was not compensated for this post. I want to make these for a 4th of July picnic I am going to. Do you know how many cups this recipe made? I am trying to figure out how many times to double the recipe? Thanks! How many oz are the serving glasses? Hi Justin, I can’t say with certainty, because I don’t have these anymore, but maybe about 1/2 cup.